Having water problems in your RV? Water filters and water softeners will help. 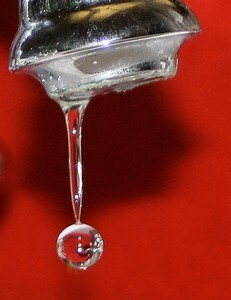 Getting a clean, clear, good tasting glass of water is as important in your RV as it is in your home. In many areas of the country, the only way to get a refreshing drink of water is to buy a bottle at your local store. Those bottles of commercially sold spring water, or "fresh-from-a-Rocky Mountain-stream” water are no better than what you get from your home tap. The only difference is those elements that create smell and bad taste have been filtered out. Many areas are plagued with hard water (including campgrounds), and RV water softeners will help correct this issue. Getting your clothes clean is almost impossible without an RV water softener. Everything comes out a dingy gray and adding more detergent doesn’t help as it produces hardly any suds. If you have these problems at home, odds are real good the same situation will be present when you visit a RV resort or campground. There is nothing worse than getting a tank full of bad tasting water in your RV. Even if you drain and refill from a different source, the odor or taste may remain as it seems to have affected the plastic tank that your RV uses to store water. Many backwoods RV campgrounds have nothing more than an old-fashioned hand pump for a supposedly drinkable water supply. Have you ever tried drinking a cup of coffee perked from such a water source? Nasty is the only word that comes to mind! Drinking water filters have been standard equipment on many new motorhomes for years. Even if your RV didn’t come with one, it can be added very simply. The usual location is a small additional faucet placed alongside the kitchen sink. With plenty of space in the cabinet under the sink, changing filter elements is quick and simple. Another option is an external water filter system. Designed to be used inline with the water hose that is supplying city water to your recreational vehicle, these inline filters will treat all the water coming into your RV. With any filter system, when the water flow starts to decrease from normal it’s an indicator that it’s time to replace the filter element. Remember that RV water filters are designed to filter out sediment and impurities that may affect taste. They are not designed to convert non-drinkable water into drinkable water. If your water source isn’t safe to drink you’ll need more then a filter. You have many types of water filters to choose from when it comes to water treatment systems. Be sure to read what types of problems they will treat as not all filters will take care of all problems. Water filters will remove sediment, and in most cases, improve the taste of the water in your RV. It is unlikely that these filters will do much to improve hard water. To improve hard water you need to use a water softener. Here again, they are installed inline with your incoming water supply. A simple garden hose fitting makes this a matter of a minute, or so, while you’re setting up camp, though a more costly option at about $250. Take a serious look at the benefits. I would also highly suggest learning more about rv water filters & sanitizing your fresh water. The minerals found in hard water are very destructive. This is why you need a sacrificial anode in your RV water heater. Soft water will allow you to lather up much better when you take your shower. When you’re done you won’t have that dry, almost sticky feeling. Clothes washed in soft water require much less detergent and come out of the dryer much fluffier with the stiffness of hard water removed. Water softeners do require maintenance, because rock salt is used in the process and must be added as the supply goes down. What If The Water In Your RV Tank Is Contaminated? If you have contaminated your fresh water tank by filling it with a bad load of water, it’s wise to disinfect the complete water system. This is a simple process that can be accomplished overnight. Drain the bad water out of the tank. Mix 1 cup of household bleach with 1 gallon of water. Pour this into your water tank. Fill the water tank from a clean source. Turn on the water pump and go to each faucet, shower, and toilet. Run the water until you smell bleach. Be sure to run both the hot and cold water. Once you smell bleach at all faucets, turn off the pump and let the system sit overnight. The next day, drain the water tank and refill with clean water. Again, go to each faucet and run it until you no longer smell bleach. This may take more than one filling of the water tank. Once the smell of bleach has dissipated, your water system is sanitized and again ready to use. With clean, good tasting water onboard your RV, you can once again perk yourself a good cup of coffee. Enjoy!